"12 Years in the Making"
I started bow hunting back in 2002 and since then bowhunting for whitetails is pretty much all I do. Each year I start scouting after the season comes to an end, start running trail cameras in the spring and hanging stands in the summer, all in preparation for the chance to arrow a mature buck during the archery season. 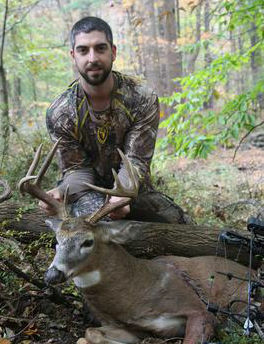 After 12 years of bowhunting, I finally connected on a mature whitetail and was able to arrow a 115" 9-pointer. I wish I could say I had trail camera pictures of this deer and put the time in to hunt him, but really it was mostly luck. My brother sent me a text the night before Halloween inviting me to hunt one of his properties with him and put me in a stand he had hung, but never hunted. At 7:15am I saw my first deer about 80 yards away and as it turned its head I saw a flash of antler. I watched as the buck closed the distance and stopped to rub its antlers three times along the way. 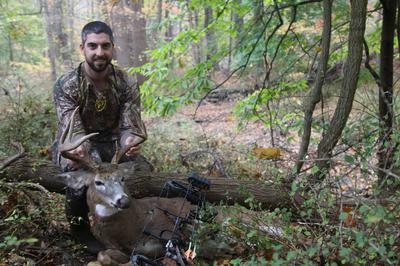 At one point the buck was within 20 yards, but the brush was so thick I couldn't get an arrow through. As the buck started to walk pass me he entered into a clearing giving me a perfect 30-yard broadside shot. I gave the buck some time and met up with my brother at the car before picking up the blood trail. It wasn't long before we found the deer and we were both impressed by the size and mass on his rack. I don't know who was more excited, me or my brother, but it was an awesome experience especially to share with my brother. It's definitely a hunt I'll never forget.